Food waste isn’t something that I’ve given much thought to. Then the green blog of an environmentally conscious church, fumcgreen shared some tips for reducing household food waste. I was inspired to learn more and now feel bitterly disappointed but inspired to share and to cultivate thoughts about ways to improve this scenario. The Swedish Institute for Food and Biotechnology commissioned an in-depth study on food waste which revealed that 30% of the world’s food supply is lost or wasted. This waste occurs at every step in the food chain from agricultural production to processing to distribution and consumption. The more industrialized the nation, the further along on that chain, the waste occurs. And at the consumption level, which is the stage I’m talking about in this post, the most wasted items are fruits and vegetables including roots and tubers. 2. Inventory your pantry and your refrigerator. Move older items to a more visible spot so you’ll use them first. Check the temperature and keep it somewhere between 35 and 38 degrees F (1.7 to 3.3 degrees C). That will slow bacteria growth without freezing your food. 3. Make a meal plan ahead of time to ensure you use what you have on hand. This will also help you avoid supermarket “three for two” specials designed to drive consumption. And everyone knows the bit about not shopping when hungry! 4. Learn to save food by canning, freezing or dehydrating. Freezing is also great for nuts, leftovers and bulk purchases. 5. Put pressure on your childrens’ school to have outdoor playtime before they eat. That way the kids aren’t tossing their PBJs in order to get to four square and the swing set. 6. Find ways to use the whole vegetable; carrot tops, beet, radish, and kohlrabi greens. This can be fun and you’ll end up with some new specialties. 7. Find useful substitutes for those one off items required for your recipe that you might not use again. This is easily the greatest space hog in my fridge. In the future, I’ll use kefir for sour cream. 8. Share. If it’s a better deal to buy a larger quantity, try to find a friend who’ll split it with you. I’ve even done this with strangers in the store! After purchase, when you have a big quantity, send some to a neighbor or have them over for a meal. 9. 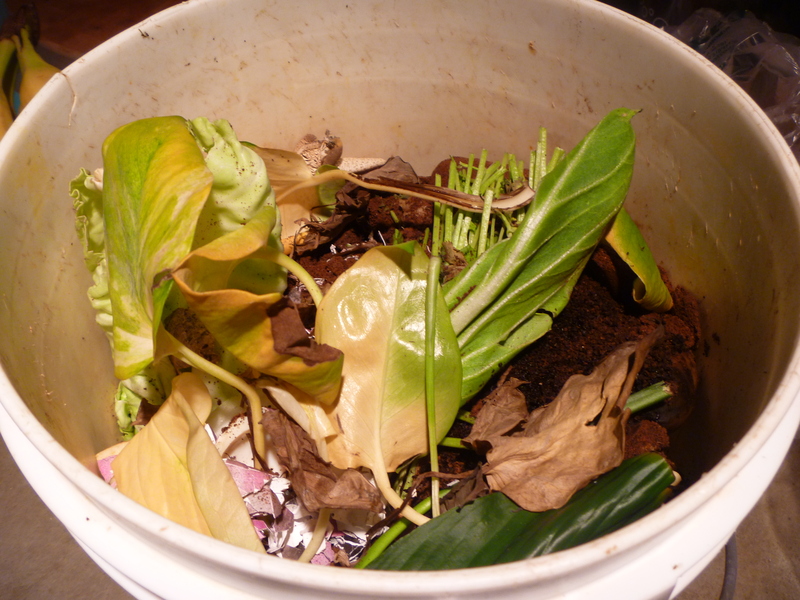 Compost the peels, coffee grounds, egg shells and other items that you don’t make stock with. 10. Buy seasonal food directly from farmers. I’ll bet you saw that coming! The Food Network put on a special a while back called The Big Waste. It was eye opening. Tonight there is a special on childhood hunger, im DVRing it but the previews looked eye opening as well. Thanks for this post! You’re quite welcome. I knew there’d be waste but the numbers are staggering. it’s approximately 100 kg per person each year in Europe and North America. Thanks for this informative and helpful post. Now that I live alone, my biggest wastes are the second half of a loaf of bread, or a partial bag of greens. I’ve started to freeze bread in bags with 2 or 3 slices per, which helps. Your suggestions will help even more. Thanks! On a previous post, a reader shared her method of freezing greens. It’s something that I haven’t done before (never any left over) but it sounds like it would be a great trick for you Cindy. If you have too many hardy greens (kale, collards, chard, spinach) . . . saute them in olive oil with garlic and crushed red pepper. Freeze in 2 cup portions to add to soups and casseroles. If you’re talking about delicate salad greens, most don’t freeze well. Yes, thanks, it’s the baby spinach or salad greens that I can’t eat fresh quickly enough. In the summer I grow my own, so don’t have the problem (though sometimes can’t eat them quickly enough even then, before they bolt!). I have used any and all greens in soups, too. When I freeze, I often do what I did when making baby food: I freeze first in an ice cube tray, then pour the cubes into a freezer container. That way, if I am making a meal for one, I can take out just what I want. I also do this with leftover tomato and other sauces. That’s the way I did baby food also. Thanks Nancy! I couldn’t remember who had given the instruction but it was you! Great add. You are on top of thoughtlessness, Tammy. Living alone and eating mainly fresh veggies and fruit, I don’t waste much food. If the leftovers aren’t soup-worthy, they go to the compost. Today, I picked up a friend, enticed her out of her pjs and we visited “Earth Candy”. Isn’t that a great name for all fresh organic veggies and a massive number of bags of wonderfully healthy food products – nuts, seeds, powders, liquids…it’s waaaaay better than going to a candy store. I’m going to be away so I had to curtail my buying. Arrived home with my bag of Yerba Mate Tea, dried Mango, fresh Almonds, a coconut and organic Maple Syrup. I have lots of soup to tide me over until I leave. Thanks for all you do for us, Tammy. Wow Amy, you have really kicked up the alkaline thing, haven’t you? We need to talk about that sometime. I hope you’re getting ready for a relaxing time. I use a juicer when I have veggies or fruit that I know I won’t have time to prepare. Great tip Diane! I do that too but I’m in the market for a new one. i rarely have anything other than yogurt for breakfast, am gone for lunch (sometimes i do pack something), and usually grab a simple dinner before heading out in the evening. it’s more the fact that i’m rarely home, than that it’s just me… but with fresh, local produce season here, i’ll be bringing home more stuff from the local market. will see if i can do better this summer! There is a blog that I really enjoy called Sustainable Cooking for One. She does great recipes and has written a book. Perfect! That is a b-day present to myself! Thanks Tammy for helping us with this. It really bothers me to pitch things. 🙂 I also appreciated the advice about not buying more than we need . Let me know how it goes for you. I was thinking about doing a post on my own trash stream. Since I’ve tuned in to this issue, I just feel awful if I throw any food out. As you know, I eat lots (lots) of fresh vegetables. So my big trick is saving all the bits and pieces for stock. If I can’t make it right away, I’ll save them in a bag in the freezer. I love having vegetable stock on hand in the freezer for soup. Thanks for bringing this important issue forward. We should all be aiming for zero waste. I just had no idea how bad it is. There are some good studies out there and worth reading. I find all the debate about industrial agriculture being necessary to “feed the world” when due to mindless consumption, industrial systems where waste is more cost effective than conservation and political issues preventing distribution of food to the hungry we are wasting as much as 40% of food. And don’t even get me started on the fact that the discarded food gets triple wrapped in plastic and thrown into the garbage where it will take up space and be prevented from decomposing. It’s awesome that you’re focusing on this and especially bringing your boys into the solution- making process. Yes! It really highlighted the same thing for me. All of the resources being dumped into industrial farming and half could be spared? And then if those same energies were spent on effective distribution systems and a couple of other issues in less developed countries, it would be powerful. I also didn’t make the distinction between food loss and food waste but I read plenty about industrial farmers acting like river boat gamblers and then letting an entire crop rot because they missed the market. And I also had a tip about the plastic but there were so many things to say! Sorry – confusing sentence. I find the hippocracy really frustrating. I hate waste and do what ever I can to prevent it, even shopping more often 🙂 great blog post! Most excellent tips, Tammy! Food Network recently did a broadcast on wasted food in America and it was shocking. It really made me take a good hard look at what we use and don’t use. Fresh berries and herbs are my worst offences. Just yesterday, had to toss some strawberries (thought we’d have a fruit smoothie for lunch, but nope). Things like that just go quicker than I think. NEED to get better organized for sure. Thank you for the wake-up call. You’re the second to point out the Wasted Food special. I find it really bothersome. I really hate it when fresh herbs go bad so I’ve pretty much stopped buying them fresh. I grow a lot but the rest are dried. We waste almost no food. I build each at-home meal around anything that needs to be eaten sooner rather than later. I love tip #5. Exercise before lunch will make them hungrier . . . more inclined to finish their food . . . and they’ll be more able to digest it if they aren’t exercising strenuously. A huge area of waste occurs at the grocery store level ~ one solution is Dumpster Diving to retrieve wasted food. That does NOT appeal to me. Another is to encourage your supermarket to partner with a local food bank, soup kitchen, or homeless shelter for them to pick up food on the verge of spoiling, dented cans, food approaching last date of sale, etc. A good resource ~ Feeding America. You’re exactly right. Waste occurs at every stage and it would be great if there was a strong program to get it from the stores to the shelters. Excellent info! Your tip #1 is vital. Several years ago I noticed that the vast majority of our trash and recycling was packaging from processed foods: frozen entree boxes, cans, bread and vegetable bags, etc. A simple thing like buying the ingredients and making our own food has enormously reduced our waste: we’re no longer buying the oversized mass quantity containers, the ingredients can be used in a wide variety of dishes, and making the foods ourselves means the ingredients don’t include a bunch of unpronouncable chemicals or endure dangerous processing. Our trash bin is now dragged to the curb about once every two months rather than every week, and we’re eating healthier for it. As you said compost is a great use for vegetable tops and peelings. Another use is adding them to a container in the fridge, then every several days making a big pot of vegetable broth. The broth can be used in place of water in almost all recipes and will add both flavor and nutrition. We have two dehydrators and have a great time making batches of whatever happens to be in season. It’s also a great way to make your own spice mixes and teas. After making almond milk I’ve enjoyed using the leftover pulp to make crackers in the dehydrator. Drying things also means no power is required for food storage in the fridge or freezer, a nice way to reduce our day to day reliance on one of our home’s biggest consumers of electricity. Seeing the film “No Impact Man” several years ago really inspired me to change a lot of habits, and I’d recommend it as essential viewing for anyone interested in these topics. I think you mentioned this movie to me before and I need to put it in my queue. It’s pretty easy to dry fresh herbs or toss them in vinegar to keep them from going to waste… but I generally prefer to grow my own because the quality is so much better! The other strategy I’d add is to schedule a clean-out meal/day. Once a week I used to eat leftovers and/or produce heading toward oblivion. It was always great to get the total clean-out done. With a family, leftovers night and clean-out night each happen about once a week. Jonathan Bloom has a great blog about food waste, although I haven’t read it recently. Thanks for the mention above! I will try to check out his blog and every Thursday night is our clean-out night. It works wonders. This is so important. I try not to waste food at all. One of the things I try to do is to keep food right at the front of the refrigerator–wrapped so you can see the contents easily. If the food gets pushed to the back, or is covered so its not visible, it’s easier to forget or waste. Great post! Yes, that’s my weakness as well but it really is usually something that I used one Tablespoon of and don’t really need again. I need to stop doing that. Great article, Tammy. And some very helpful hints. I am guilty of food waste. But I do my best to reduce it through composting, as you suggested, and feeding vegetable extras (like carrot and celery leaves, and stems from other greens) to my bunny. My mother had a huge deep freeze, so would preserve seasonal fruits and vegetables to be enjoyed throughout the year. Learning how to can is on my list of things to learn! I learned how when I was young but don’t do it any longer. It is something that I’d like to pick up again when I have a bit more time. Last time I visited the USA I was horrified at the serving sizes. A good way to reduce overall waste (and to help your economy) is to reduce the size of the meals served in restaurants. The cooked breakfast at our hotel included three eggs, four rashers of bacon and three slices of toast. In Australia it would be two eggs, two rashers and two slices. A takeaway milkshake came in a one litre container. I was horrified, there needs to be a choice of small or medium and small should mean small. Originally I was going to suggest smaller portions as a tip but felt like I had enough other stuff to work with. You’re so right though. American restaurant portions are out of control and should be split. Great post again, Tammy! The food that’s the most likely to go bad in my fridge is veggies and meat. Meat I usually stuff into the freezer before it goes bad, and veggies that need to be finished off I use for making veggie soup or stock. I’m not great in this area since we don’t have a composter in our building. I reserve my sink garberator for small light veggies. I don’t want to wear out the blades. The best I can do is not buy produce with alot of packaging. I don’t eat much processed food at home. I’ve amassed a ton of yogurt containers…great for art paints, etc. I wonder if there is a community compost somewhere that you can go? I seem to remember that you are in Vancouver? It seems so green there. Sometimes you can throw those light veggies into the freezer and then make some stock. It’s wonderful to have on hand. And good for you for saving the yogurt containers. They also make a great place to start seeds. Point 7,8,9. Fantastic tip. Wastage feels really bad… When we were young mom used to make a dish called “Piled up”. It was basically all the left over veggies seasoned with spices and piled in one plate with shredded chicken and mozzarella on top. Once assembled, its baked and served. What a clever way to reuse food. I love the concept of Piled Up. I’ll have to see what I can do with that! clear containers are a great idea. Oh how I wish schools would heed your advice to have recess BEFORE lunch. Kids always through out a ton food just so they can get to the playground. These are great reminders and ideas Tammy! At my son’s last school, we actually got them to pilot this. Of course, we left before I could see if they decided to implement. At our new school, they get it from the start. Perfect solutions to less waste! Great list. I’ve seen those numbers, too, Tammy. When you compare the pounds of food wasted to the numbers of people who go hungry, it is simply staggering. But-add to that–as you so wisely note–the other costs of waste, the energy expended, the landfill glut and it takes on greater proportions. We who have abundance must become more mindful of our use. We really do need to! This is a topic that I plan to give more thought to! As always, Tammy. Great post. You’ve, once again, made me conscious of something I wasn’t too conscious of. Very important work your’e doing here. Thank you again, and many blessings to you and your family! Thanks so much Ollin! I appreciate you coming by and your tweet. Food waste is frightening when you lay it against the numbers of people without food. I like this post a lot and wondered if you would let me copy it to post it on my blog? As long as you give credit, I’m fine. Use the reblog feature and then you can write your own introduction. Tammy, I love this post: a fantastic list of practical ways we can use what we have wisely. Thanks. Kate, it’s been eye-opening for me and troubling. This issue of food waste is deep. I highlighted things that we can do as consumers but honestly, there is so much waste in the distribution and marketing. It bothers me to think of how many people could be fed with it! Great post! The two I want to focus on right now are observing what goes into my trash (well, compost, but still…) & getting my shelf-stable foods better organized by expiration date. Great places to focus! I am thinking of doing a trash post! I think the periodic inventory tip is huge. There are many times, I’ve planned to go shopping but then did a quick check and decided to use something I had on hand–which might have spoiled if I’d forgotten about it. We even do leftover potluck dinners if things are piling up. Of course this also saves money–and time! Yes, I agree and my inventory needs to start with those smallish jars on the top shelf in the back of the fridge. Thank you! I had the exact same experience changing my son’s school. Wonderful post. Since our last child has left the nest, there is a decrease in my cooking. With having chickens, they take care of a good part of the waste and the rest goes to my compost. Just loved your post! Yes, I remember when I had chickens that I could throw waste to them. That was years ago. Thanks so much. Love this post! I am my fathers daughter for sure – sharing his abhorrence for food waste. Yet as a bust woman who lives alone I throw out more than I should. Will continue to focus on wasting less. Thanks for some great ideas! This is such an important topic. Thanks for sharing it with us. We tried a Zero Waste Challenge last summer, and it was really eye opening. Here’s my take on what we learned: http://food4five.wordpress.com/2011/10/12/the-zero-waste-challenge-increases-mindfulness/. And for point #6, if you can’t think of anything creative to do with the tops (or bottoms) of veggies, accumulate them all in a bag in the freezer, and then when it’s full up, make a vegetable stock. Then compost the now soft veggies! I always have stock in the house now! I love to make stock and have a bag accumulating right now. Can’t wait to check out your zero waste post! Great advice. I HATE throwing food away. and don’t do it much. Like you said, it’s usually that one item bought for a specific meal. Yes, eating leftovers is a great strategy. Thank you for opening our eyes. Yes, I can see wastefulness everywhere, even in my home which I admit is embarrassing. I would buy food that is more than 3 people can finish. This is a reality check for me. I will reread the list again and check my ref and pantry. By the way, whenever I go to the buffet restaurants, it kills me how a lot of them throw the left overs when a lot of people out there are hungry and it’s actually more than 30% of the food served. Have a blessed weekend. Yes, my tips only focus on the home but what is obvious now is that food is wasted in the distribution system and then at the grocery and restaurant level. Thanks for your post – I hate wasting food! I make my husband clean the kids’ plates! I’m sure he’ll be happy to be relieved of his duty when we get the laying hens eating scraps! Cleaning the plates is something that I had to give up because I was the one eating it! Oh, and one more thing, you can hide just about any leftover in a burrito or scrambled eggs! This is such a lovely post! I love your good tips! I learned a few new! That’s what it is designed to do. Perfect! We used to put some food in the rubbish bin, too, but I don’t really recall when that happened last time. Sometimes I put bread away that is off, and when I’ve bought some sausages or other stuff I hate it goes off as no one (apparently) eats it after all. But fresh vegetables and food like that doesn’t really get bad, and you can always use them up into eny dish! Those are all good practices. It does sounds like the retail distribution gets stuck with quite a bit. Thanks Ann. Any tips to add? Really great advice here Tammy! Same with the soup stock comment, I totally freeze bits here and there. And a newly found use for those parmesan cheese rinds that you would normally throw away… throw them in a soup and then remove at the end! Totally yum. Yes, isn’t that great about parmesan rinds? I only learned that in the last couple of years and I was amazed at the flavor contribution.